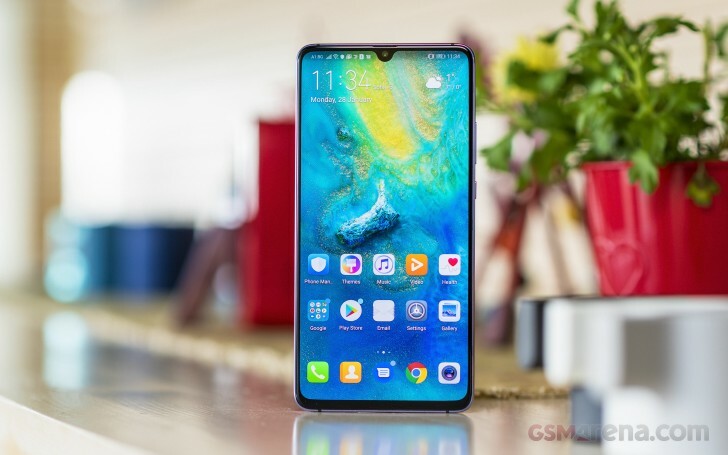 The centerpiece of the Huawei Mate 20 X is that 7.2" AMOLED screen with a tiny waterdrop-like notch. Despite the large diagonal, the display has a resolution of 1,080 x 2,244 pixels or 346ppi. That's far from a top-notch pixel density, but still enough for both a daily driver and a multimedia device. In fact, the 1080p screen of the Mate 20 X should be ideal for gaming, which is one of the key selling points of the phablet. It should allow for great app compatibility and top performance with the Kirin 980 powerhouse underneath. The OLED panel has a Diamond PenTile matrix, like most of the OLEDs these days. If you stare long enough and at the proper content (text mostly), you might be able to tell it's a PenTile from the rough edges, but that's about the only time, really. The screen of the Mate 20 X has two Color modes - Normal and Vivid. Each of those also has three sub-modes - Default, Warm, and Cold. The Vivid option represents the DCI-P3 color space, while the Normal one switches to sRGB color space compliance. Huawei hasn't specified this anywhere, so we found that out empirically in our lab. Anyway, the Mate 20 X comes set on Vivid by default and we suggest leaving it this way. The mode offers 460 nits of (manual) maximum brightness, but it can go as high as 655 nits in bright light if you leave it on Auto. The minimum brightness we measured is just 1.8 nits. The average deltaE we measured for the screen on Vivid is 4.4 with a maximum deviation of 7.8, which is not the best accuracy, but fine enough. You can fix the bluish whites by switching to Warm color temperature, but the overall accuracy won't improve by much. The color accuracy for the Normal (sRGB) mode is better though with an average deltaE of 2.4 and a maximum deviation of 4. The sunlight contrast on the Huawei Mate 20 X is excellent, but we expected nothing less from an AMOLED screen. The Huawei Mate 20 X is powered by a very large 5,000 mAh battery. The Mate 20 X supports the company's proprietary SuperCharge at 5V and 4.5A. The required cable and charger are bundled with the X and they can fill 47% of a depleted battery in half an hour and reach 100% in about 100 mins. There is no wireless charging support on the Mate 20 X. That, and the 40W Super Charge support, are reserved for the Mate 20 Pro. In our testing, the Mate 20 X lasted about 18 hours looping videos and north of 15 hours running our web browsing script. The 3G voice call test returned a 29h talk time. The overall Endurance rating ended up 108 hours - the best among the three Mate 20 devices we've tested. While the standalone tests are in line with the rest of the gang, the larger battery helped for a better standby endurance and thus the higher battery rating. Our battery tests were automated thanks to SmartViser, using its viSer App. 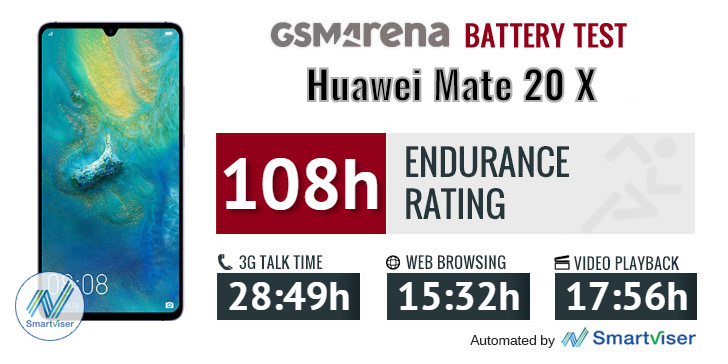 The endurance rating above denotes how long a single battery charge will last you if you use the Huawei Mate 20 X for an hour each of telephony, web browsing, and video playback daily. We've established this usage pattern so that our battery results are comparable across devices in the most common day-to-day tasks. The battery testing procedure is described in detail in case you're interested in the nitty-gritty. You can check out our complete battery test table, where you can see how all of the smartphones we've tested will compare under your own typical use. The Mate 20 X has stereo speakers, but not the one-real-one-pseudo type we've seen on many P and Mate phones lately. No, Huawei has opted for the real deal on the Mate 20 X - true identically large speakers - one at the top and another one at the bottom. And the earpiece is just that - an earpiece. The maker has improved its speaker game. Both speakers sound equally loud, with deep bass and overall rich output. 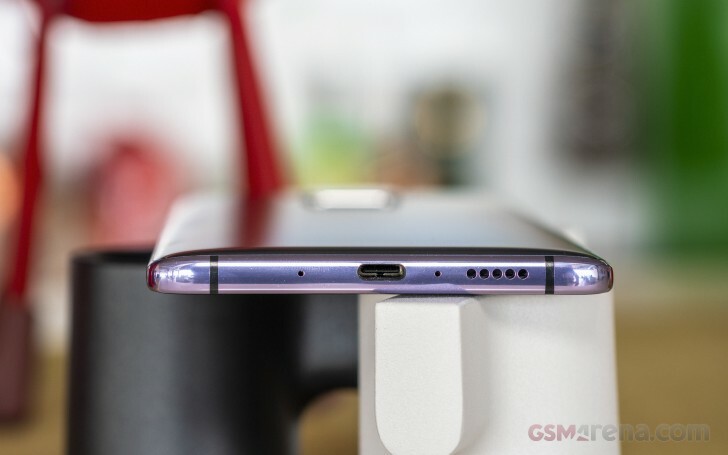 In fact, we played a music track on all three Mates, the P20 Pro, the iPhone XS, and iPhone X, and the Mate 20 X sounded much better than all of rest. And after all this praise it shouldn't be a surprise that the Mate 20 X speakers scored an Excellent mark in our loudspeaker test. Huawei Mate 20 X did well with an active external amplifier, outputting the test tracks with perfect accuracy and high volume. It also handled headphones perfectly with a well-contained hike in stereo crosstalk the only notable change. Loudness remained well above average too, adding up to a very solid overall performance. You can learn more about the tested parameters and the whole testing process here.